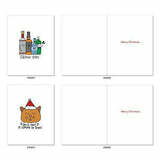 10 ASSORTED CHRISTMAS CARDS - Inside text reads Merry Christmas. If you're looking for the perfect season's greetings cards for friends and family of all ages, then look no further! These cute cards feature cute, colorful illustrations with coordinating Christmas puns. Send a perfectly punny card this holiday season! All mini cards ship with envelopes & arrive in a reusable box. 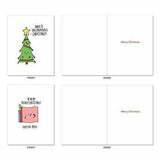 MINI GREETING CARD SET - Our (4 x 5.12 Inch ) note cards are smaller than a typical 5 x 7. 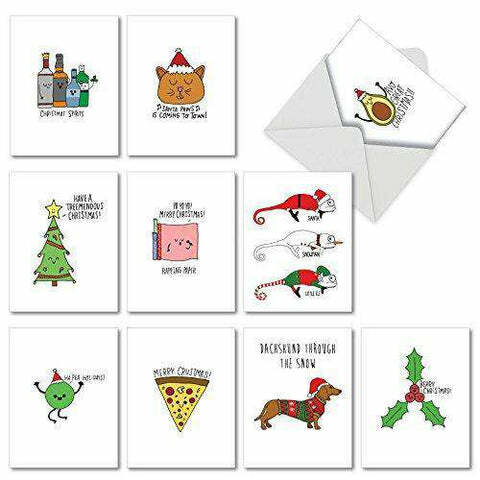 These adorable cards showcase little drawings of common items like pizza saying, Merry CRUSTmas! It may sound cheesy but we love puns! We offer a wide assortment of designs and art styles, offering a unique match for men and women looking for the right note card for their special, personal message. 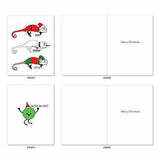 WISH A HAPPY HOLIDAY - These cards are perfect for wishing friends, family, neighbors, and coworkers a happy holiday. 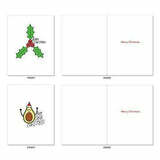 Give the gift of a card with your own written sentiments. Tis the season to send cards! 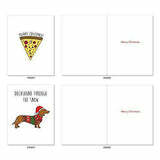 A variety of the art and designs in our note card sets look great framed! Try framing them individually, or grouping several in a collage frame, to create visually appealing wall decor. ABOUT US - Founded in 1980, NobleWorks â and The Best Card Company, its non-humor division is an award winning brand and an American based, family owned publisher. A proud board member of the Greeting Card Association, we strive for 100% perfection and customer satisfaction â every card, every order, every time. We are here to serve whether you purchased our stationery directly from us or from authorized resellers.